Dale Earnhardt Jr. told Dan Patrick on Wednesday that he would eagerly — but nervously — welcome the chance to announce the Washington Redskins’ pick — 13th overall — in the NFL Draft. “Any fan that gets asked to do that, they’ve got to get up there and do it and I would definitely take the opportunity if I ever got that chance,” Earnhardt Jr. said on “The Dan Patrick Show,” airing on NBCSN. 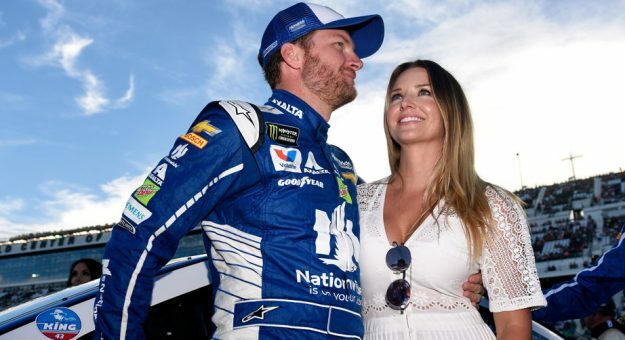 There’s one problem, though; Earnhardt Jr. and wife Amy are expecting their first child on May 2, less than one week after the first round of the 2018 NFL Draft is held on April 26. The preparations for the couple’s baby girl in full swing, Earnhardt told Patrick that he received a tour of the hospital recently. “I just can’t wait til she gets here, I can’t wait to meet her,” he said. “… During the tour the other day, they took us into one of the rooms and they showed us where the delivery room is and they’ve got that little table there and damn, I about choked up just doing that. The baby ain’t even here and I’m looking at this little table and I’m getting choked up like she’s here. Earnhardt was mum on the baby’s expected name that he and Amy have one picked out, saying he’ll “get in real big trouble if (he tells).” Plenty has changed for the former No. 88 wheelman in a year; this time last season, he was preparing for the Monster Energy NASCAR Cup Series’ race at Texas Motor Speedway. Patrick also pointed out another part of the delivery experience that Earnhardt is all too familiar with. “Yeah! I know, I’m excited,” Earnhardt said. “I think the drive there and the drive back are going to be two completely different drives.